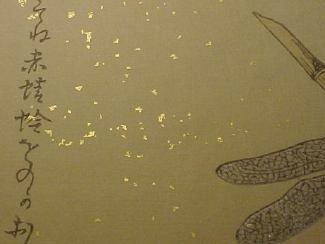 Many of the old woodblock prints in the genre known as 'surimono' made use of metal 'pigments' in their manufacture. Metals were used as leaf, powder, flake, or filings, and, when used with discretion, could add quite a feeling of luxury to the print. 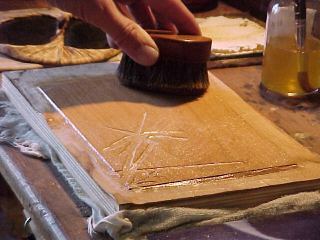 This effect is most commonly used in papers for calligraphy here in Japan, but now and again, one sees it used on a woodblock print. 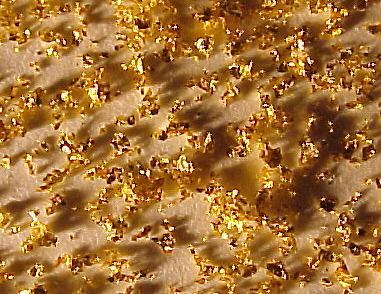 The flakes are usually not purchased in that form, but are made up by the printer himself from standard gold leaf. The tools one needs for this are simple - a strainer (sieve) with a good stiff mesh, and a brush with short and stiff bristles. 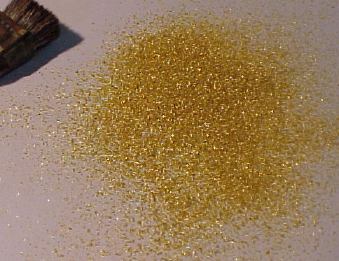 To make enough flakes to cover the background of 200 prints of about B5 size, about ten standard sheets of gold leaf are needed. 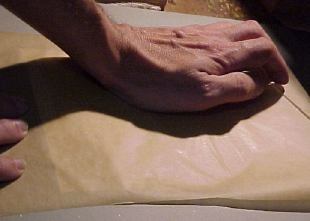 Before each sheet is 'processed', it must be lightly - very lightly - dusted with talc. 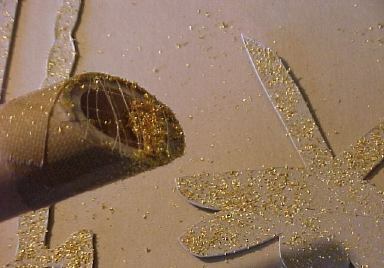 Without this dusting, the flakes would stick together in the applicator tool; with too much talc dusted onto the leaf, the flakes will not adhere well to the paper. After each leaf is dusted, place it into the strainer. 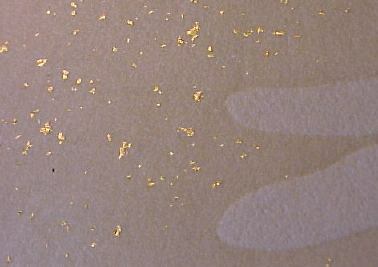 Move around the leaf, 'chewing it up' section by section, until all the gold has been turned into flakes. 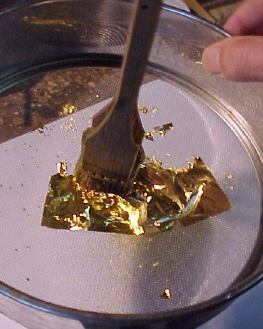 Try to avoid having the leaf fold over itself in the strainer, as this will cause it to adhere to itself, producing 'lumpier' larger flakes. These hairs (which I collected from myself) are glued in place over the mouth of the tool and protected by strips of tape. 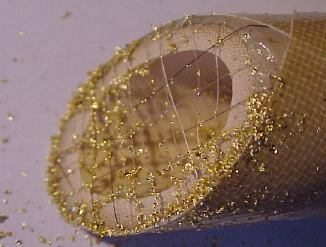 The openings in the mesh should be just a bit larger than an average flake. Once the tool is ready, the sunago is 'loaded' into it by pouring the flakes into the open back end of the tool. For this print, I wanted a 'tone' on the paper, so I printed a background tint in the usual manner before any of the other steps. (I also put a light gradation on the background, working up from the bottom of the sheet.) 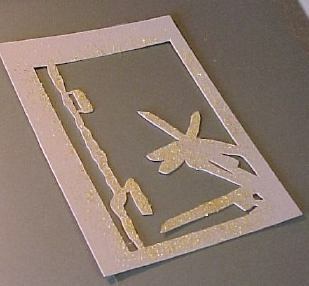 The paper was then ready for the flakes to be applied. The flakes will be bonded to the paper with nikawa, liquid gelatine - the same substance used to size the paper. It should be mixed with enough warm water to allow it to be brushed over the block, but not so much as to dilute its 'stickiness'. 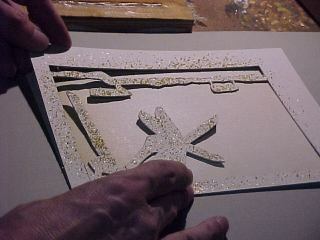 A few trials are in order, to ensure that the flakes on the finished print will adhere properly. 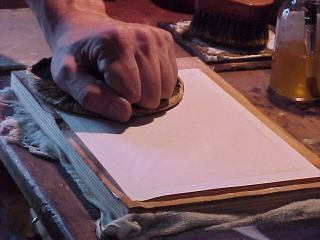 Once the block has been coated smoothly, lay the paper in place and lightly use the baren to ensure that contact has been made everywhere. 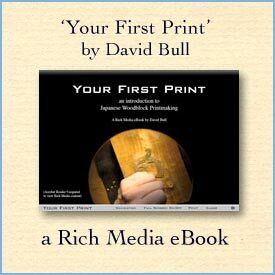 Do not use as much pressure as you do in normal printing - you want the gelatine to remain on the surface of the sheet, not to be pressed down into the fibres. You will have to occasionally tap the takezutsu with a fingernail of the opposite hand, to dislodge more flakes. 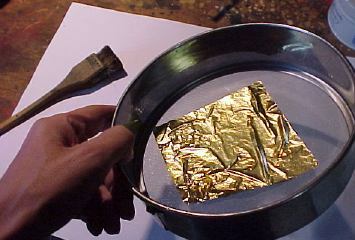 Keep the waving motion going though, or you will get an uneven distribution of flakes on the surface of the sheet. 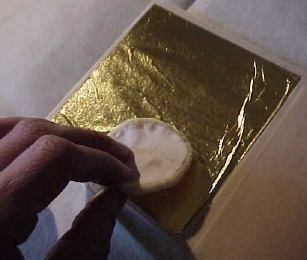 When you've got the coverage you want, lay the takezutsu back down gently, lift off the mask, and cover the paper with a sheet of something smooth for the next step. Rub with the heel of your palm firmly over the entire surface, to flatten the flakes in place and ensure that they are bedded into the wet surface. The flakes could actually be scraped off at this point, but if they are not disturbed they will remain in place, and when the paper is dried at the end of the printing process, they will become permanently fixed. My concern: what keeps the print from sticking or being ruined when rubbing it onto a moist wooden surface, and then rubbing a piece of paper over the moistened print? I myself have no experience with doing this sort of thing with other papers. 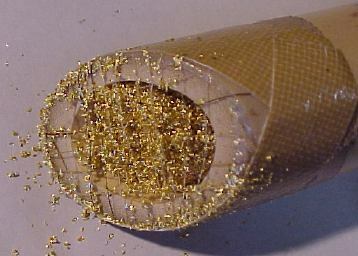 The Japanese washi that we use easily withstands this sort of glue treatment. Whether or not your paper will work, I can’t say.